Swimming pools are major resource sinks. If you are gifted (or cursed) with a swimming pool or spa, a pool cover is an essential item. It helps improve the safety of the pool by preventing small kids from falling in and it helps reduce electrical, heating, and chemical costs. Pool covers are not substitutes for fences. Every pool should be fenced and locked. Many localities including ours require a perimeter fence around the pool. Some vendors claim up to 80% savings using a swimming pool cover. This is a little optimistic. You can measure how much water you lose every month by making marking the side of your pool’s tile. Refilling a pool with water costs a lot of money. Your water will also stay warmer with a pool cover. In our own experience, it is a no brainer to get a cover for a pool, but they do cost thousands of dollars. The thermal blankets you can drape over the water’s surface do not provide the same level of performance as a vinyl pool cover. The only downside is that you need to pump water off your pool cover a couple times a year. Look at all the gunk that we prevented from entering our pool! These covers come with a 7 year warranty. Our last cover lasted only 6 years then it started fraying near the ropes situated at the side of the cover, where the stitches are. They are not repairable, so we had to live with it as long as we could still open and close the cover. After about 6 months, we weren’t able to close the cover any more. The fabric became sheared off near the sides. When we went to replace the cover, we found it costs about $2,200 to redo it. Hopefully it will last 7 years. Our original cover lasted a lot longer, probably because the previous owner did not use the pool much. Even with such high costs, we feel it is essential to have a swimming pool cover to save money and be more green. The period when our pool was uncovered, allowed us to see how much chemicals and time is spent when you don’t have control over water and chlorine evaporation. Also consider getting a variable speed pool pumps to save even more money. Don’t forget to get your pool heater checked and serviced. This will ensure it runs at 100% efficiency. Save money on pool chemicals by using common grocery items. In 2016, I noticed Leslies Pool was selling Cover Free – Liquid Solar Cover – 2 for $49.98 on sale. What the heck is a Liquid Solar Cover? This is also supposed to help you save hundreds of gallons of water. When liquid solar covers work well, they will roughly cut down heat loss in half whereas a bubble-type cover can cut it down by 75% or more. Swimming Pools are one of the least green elements of a home. Unfortunately they consume lots of power, water, and harmful chemicals. Heating a pool with a traditional gas pool heater can cost hundreds of dollars for a couple hours of fun. Solar Pool Heaters harness the power of the sun to heat your pool. They are essentially rubber tubes laid on your roof, through which your pools water passes through. The warmth of the sun heats up the water. Most solar pool heater systems utilize your existing pool pump to push the water into the water coils on your roof. Some situations will require a booster pump. These systems can cost from $2000 to $5000. These systems include a Solar Pool Heater controller that you can set to turn off the system or prevent water over a certain temperature from getting circulated. Solar blankets that lay on top of your pool do not work very well. We could only coax a couple degrees out of them. Solar blankets also deteriorate in a couple years. Our solar pool heater system has worked well, heating water well into the 80’s and easily extending the swimming pools season. One downside is that you may hear pool water gurgling up to your roof when it is running. Also consider using a swimming pool cover to reduce the run time. A variable speed pool pump also saves energy. There are a few things I wanted to add to this. 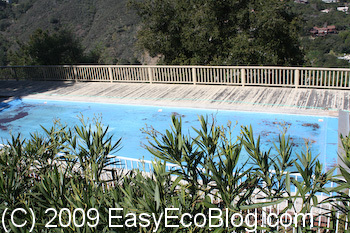 I think it is wonderful that you are promoting pool covers; it is possible to save huge on energy and water bills! However, I want to make sure people understand the difference between solar covers and safety covers. Plastic solar covers DO NOT increase safety, and can in fact lead to entrapment issues. However, safety covers are created to ensure safety in pool environments. There is a big distinction though. I must agree with Monique in regard to the differnce between a safety cover and a solar cover. I would also like to point out another differnce. Most tension style safety covers, use of a spring attaching to an anchor in the surronding deck, are designed to be used during a pools closed season. Putting a tension safety cover on year round will cause the cover to wear from sun damage as well as ddamage from handling. The cover eill also take time to put on and off properly. A track driven cover will work well for daily use but they are not always suitable for a region with heavy winters. A swimming pool cover should be required with all pools. That is just how I feel. Pool covers are ideal for protecting the pool when it is not used for long periods, or for preventing access from unauthorized people, young children or pets. At the same time, they help maintain the temperature of the water, extending your fun time in the pool. Plus, they keep the pool clean from leaves and debris and they reduce water and electricity bills and the costs for disinfectants. In short, you make a worthwhile purchase.